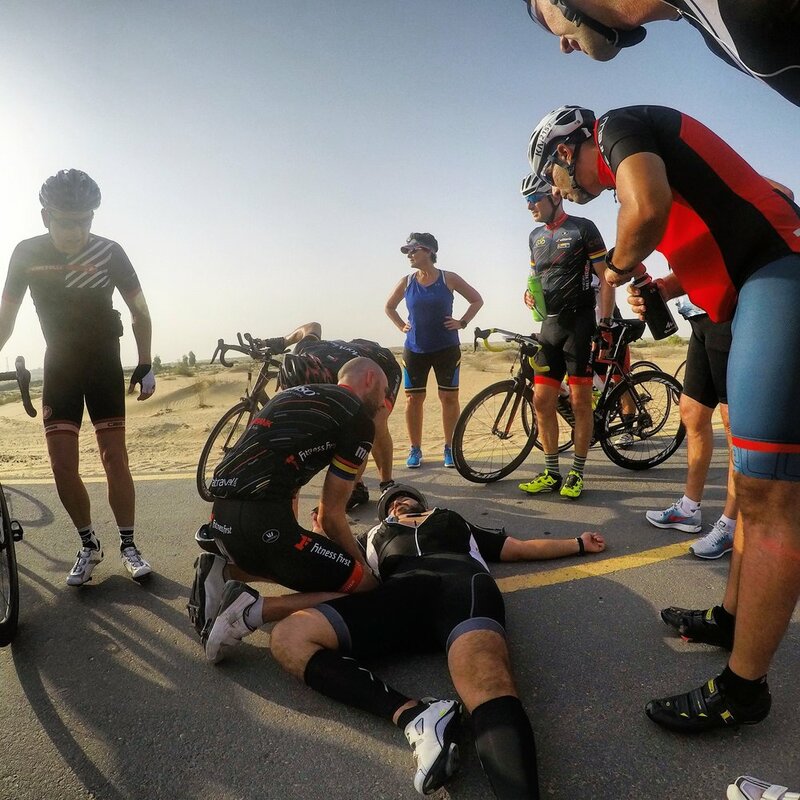 Riding in Dubai is not for that faint of heart. The experience of riding in the middle of the desert with no worry an automobile steered by a driver on too much ego blasting you at 160kph is no longer an issue. It takes a certain mentality to sustain riding in the desert once a week let alone 400 km plus. Fortunately for the novice, the Dubai Municipality has created near 200 km of dedicated bike paths around the city. Though that sounds like a lot and it is, these paths can become monotonous and over run with Triathletes, large groups, newbies and the general bike rider who’s out to experience a ride in the desert. I ride 5-6 days a week putting in 12 hours average. I find these paths to be some of the most mind numbing and dangerous paved routes I’ve ever ridden in. Having a path is great for some and mostly the novice but builds a false sense of security and develops little actual riding skills. This leads to people with endless incomes looking to break up the sedentary lifestyle to compete for any advantage to beat the next guy or get their fastest time on Strava. Flaunting the best of the best the cycle world has to offer but not fully understanding the very basics of what it takes to ride safely and correctly and get the most from their ride mentally or physically. Open 24 hours your ride in the middle of desert, located miles away from populous areas the largest track and most used is the most dangerous for inexperienced riders. 120km of paved path with uninterrupted views of small dunes and sand vistas or a moon you feel you can reach out and touch. The closest forms of population lie in a beautiful boutique hotel, convenient store, mosque, fast food vendors, a horse store and an inadequate rental bike shop. All of which are not open 24 hours and located at the parking lot upon where you begin. This means that as being on the road with the rest of the world you’re just as on your own but even worse. If you don’t have adequate hydration, and extra tube or emergency gear, you truly put your life at risk. More so than riding in an area with homes or even petrol stations. Just like riding at night without lights on the street it becomes even more dangerous when you have an angry triathlete or group coming at you 35 kph + and cannot see you do to not being lit adequately. Then comes the real emergency, what do you do? You wait for another rider or lie unconscious in the middle of a desert where help could be an hour away.